* zero-coupon bonds, do not pay a regular coupon. Instead, they are sold at a discount to their face (or par) value. The federal funds rate is the primary tool that the Federal Open Market Committee (Fed) uses to influence interest rates and the economy. The interest rate at which banks and other depository institutions actively trade balances held at the Federal Reserve, called federal funds, with each other, usually overnight. 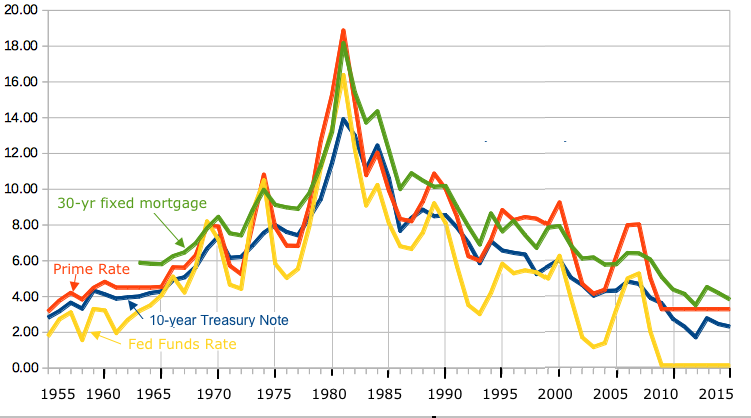 Changes in the federal funds rate influence the borrowing cost of banks in the overnight lending market, and subsequently the returns offered on bank deposit products such as certificates of deposit, savings accounts and money market accounts. Prime Rate - The rate at which banks will lend money to their most-favored customers. The Wall Street Journal surveys the 30 largest banks, and when three-quarters of them (23) change, the Journal changes its published prime rate. 10-Year Treasury Note - A debt obligation issued by the United States government that matures in 10 years. A 10-year Treasury note pays interest at a fixed rate once every six months and pays the face value to the holder at maturity. The interest payments are exempt from state and local income tax. However, they are still taxable at the federal level. Treasury Notes can be sold before maturity. If the interest rates have gone up the value will be lower than the face value. If interest rates go down the value will be higher. T-bill - A short-term debt obligation backed by the U.S. government with a maturity of less than one year. Commonly have maturities of one month (four weeks), three months (13 weeks) or six months (26 weeks). Mortgage Rates: Mortgages come in several vareties. Fixed Rate - Rate is the same for the term of the mortgage. ARM - Adjustable Rate Mortgage. Rate can change after some specified fixed period (frequently 7 years). A 10/1 ARM has a fixed rate for 10 years and adjusts annually for the remaining term. A 5/1 ARMs rate is fixed for 5 years. Lenders base ARM rates on a variety of indices, the most common being rates on one-, three-, or five-year Treasury securities. They are regulated by the Federal government, with caps on charges. Typically 2% per year or 5% or 6% for the life of the loan. ARMs generally permit borrowers to lower their initial payments if they are willing to assume the risk of interest rate changes. FHA - A mortgage insured by the Federal Housing Administration. Borrowers with FHA loans pay for mortgage insurance, which protects the lender from a loss if the borrower defaults on the loan. APR - Annual Percentage Rate - The interest rate for a whole year (annualized), rather than just a monthly fee/rate. It is slightly higher than the nominal rate, Because of compounding the bank gets more when you pay each month rather than hang on to your money until the end of the year. Points - A % paid up front at the time of the loan.